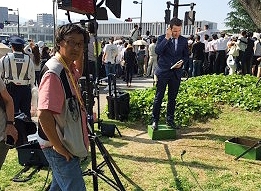 Tokyo's ITM provided live broadcast services at the G7 and Hiroshima. Japan, June 2016: Tomoo ITOH, the founder of Tokyo's leading news production company, INTERTELEMEDIA, Inc. - together with his staff - was on site at last week's G7 Ise-Shima Summit to provide coverage to foreign broadcasters. 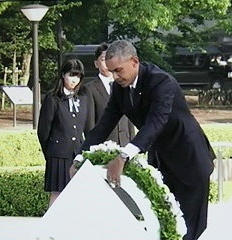 In addition, they were also on hand for President Obama's visit to Hiroshima. Kyoko Mizukawa, serving as a coordinator for the U.S. Pool, made all the necessary preparation and execution for the U.S. pool to provide live positions to its pool members, as well as to receive the host signal produced by NHK, the host broadcaster of the event. The coordination involved liaising with the U.S. pool producers and technicians, the U.S. Embassy, MOFA of Japan, the City of Hiroshima, and the most important player of this historical event on the broadcast side, NHK. 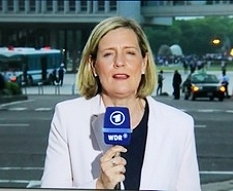 Her efforts made it possible for major U.S. networks to deliver live coverage of the historical moment from Hiroshima. Jiro Akiba, an experienced cameraman, worked as a video cameraman producer of BBC. 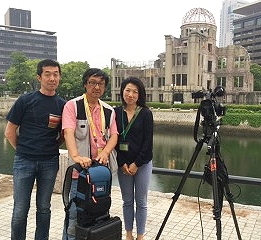 Another ITM staff member, Futa Nagao, filmed for AuBC producing a package of President Obama's visit to Hiroshima; the camera work was greatly praised. Juntaro Ishikawa, experienced his first G7 Summit, working as a cameraman for Shanghai Media Service, as Global Media Service of AP Television. Toru Itoh, who newly joined ITM in April 2016, has also gained his first experience by supporting ARD's White House accompanying journalist, both at the G7 Summit and the Obama/ Hiroshima visit. And finally, Tomoo Itoh, having long years of experience, was operating EBU live position, providing service to ARD, ZDF, Swiss TV, and a few other European broadcasters.